Affordable UK holiday accommodation has definitely had a revamp in recent years. First of all we had the Glamping revolution, to bring camping right up to date. Tents were completely made over. And then along came yurts, teepees and wigwams – all edging their way into campsites. The bar had been raised on UK accommodation, and this extended to B&Bs too, with tree-houses, boathouses and lighthouses becoming popular. And all the time the humble caravan said nothing. 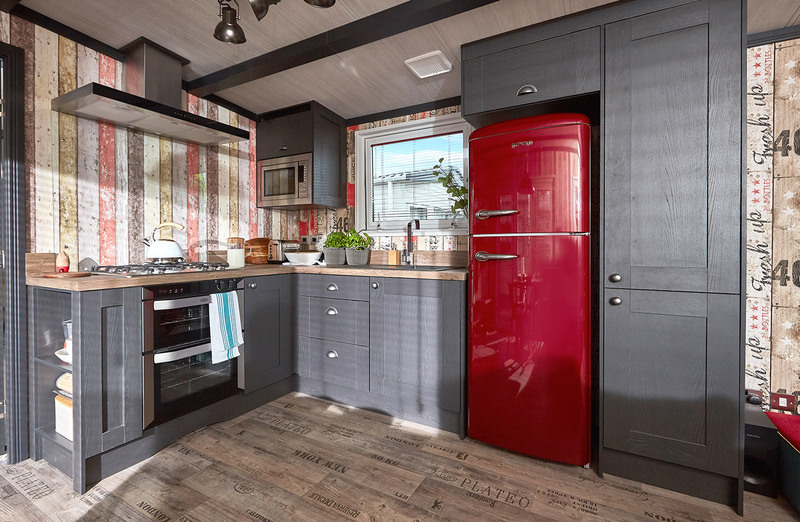 Away Resorts and ABI have developed a seriously cool kind of caravan called The Tribeca that will make everyone re-think what a caravan is. It’s that radical. 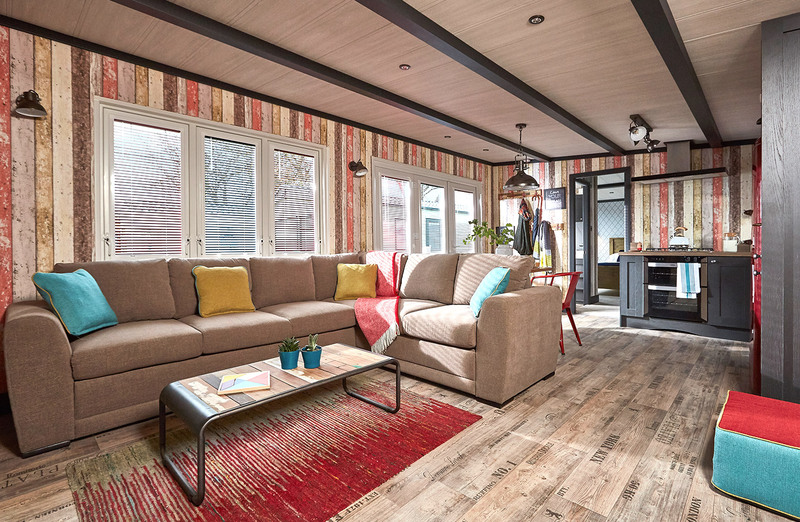 The cool caravan has arrived, and it's fit for all the family. Designed especially for families, mums and dads will love the central, light-filled, open-plan living space and kitchen. With its high roofline, free standing furniture, New York loft style décor and panoramic glass sliding doors creating a nature-on-the-inside vibe, this could be an uber-trendy apartment in Berlin. The sophisticated design treatment uses art, colour and texture to create a boutique hotel feel, and makes the very most of every inch of space. But that’s not all. The grown-ups’ sumptuous bedroom features a stand-alone, roll-top bathtub, and an en-suite. 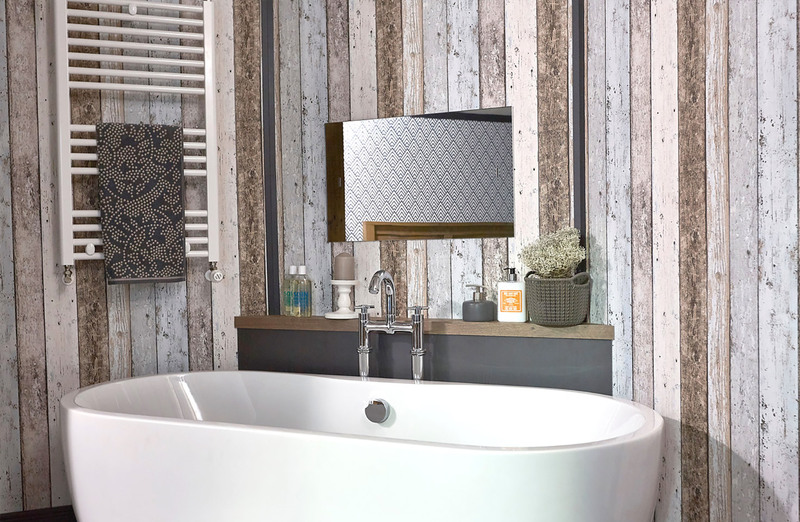 Magically, there is a hidden TV behind the mirror so you can lie back in the bath and watch a show. When you are finished, the TV transforms back into a mirror. 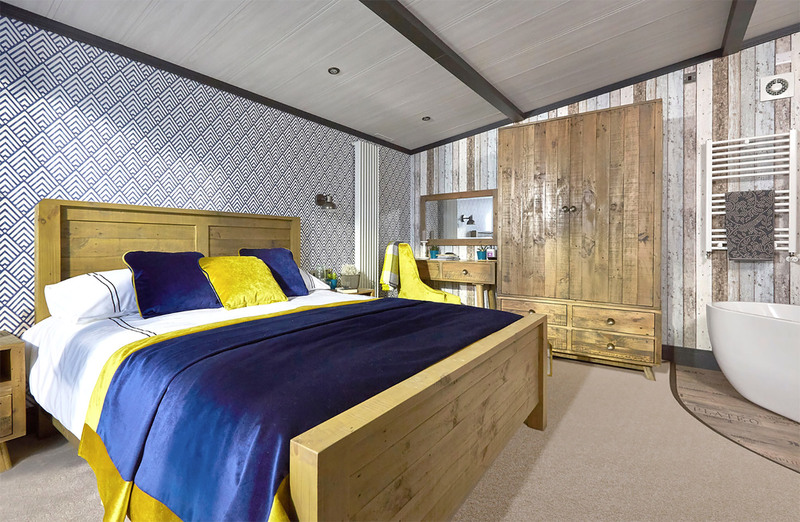 There is also a second 32 inch TV screen, viewable from the king-size bed, complete with stylish cotton bedding making the parents room an idyllic holiday sanctuary. The Tribeca’s design is about form and function. Designed by women, the team have considered all the little details that will make your holiday more enjoyable. The plug-points are all in sensible places, near to the mirrors, to make drying hair and getting ready easy. And there is a full-length mirror too, so no more standing precariously on a chair and bending from the waist to view the outfit’s full effect. Plus, there is plenty of storage space in free-standing wardrobes – and room to hang up long dresses and trousers. 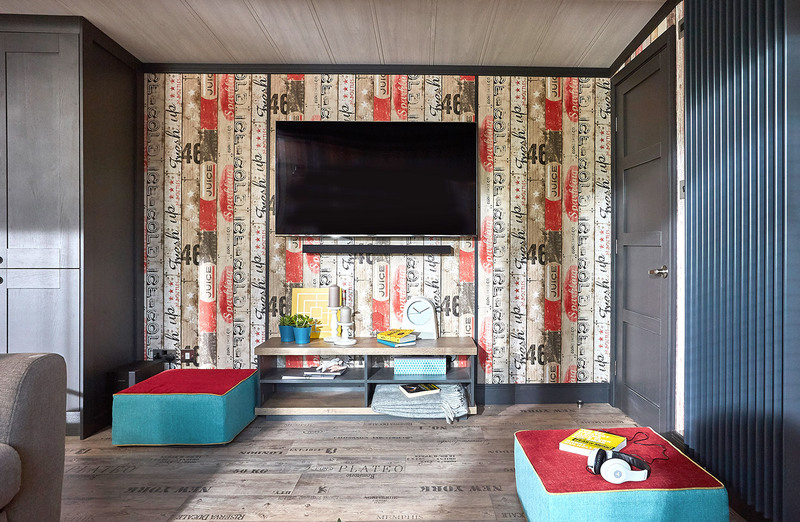 The kids’ / teens’ room would be groundbreaking in a designer hotel, let alone a caravan. The timber-effect walls and huge windows create a jungle feel and the astro-turf flooring carries on the theme of bringing the outside in. 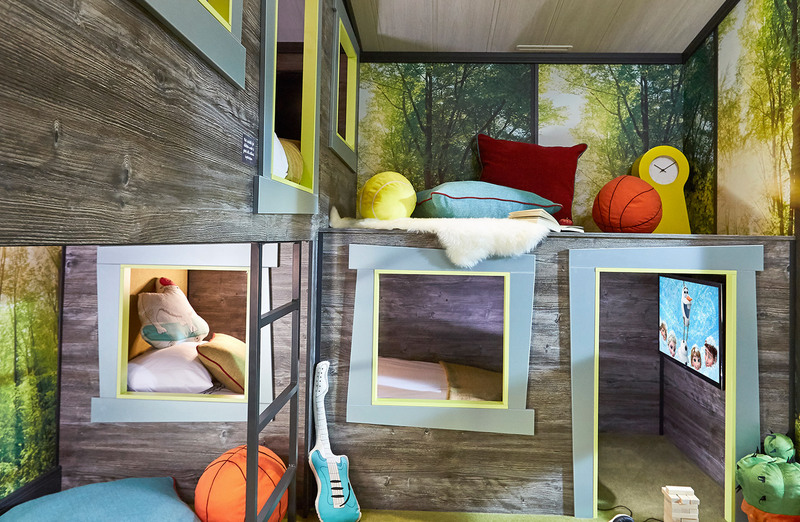 The bunk-beds come complete with dens underneath and each bed has its own TV screen and sockets for gaming. And the kids also get their own en-suite with shower and loo as well, which is very good news for everyone, especially at 9am in the morning when the family-fight for the bathroom usually begins. 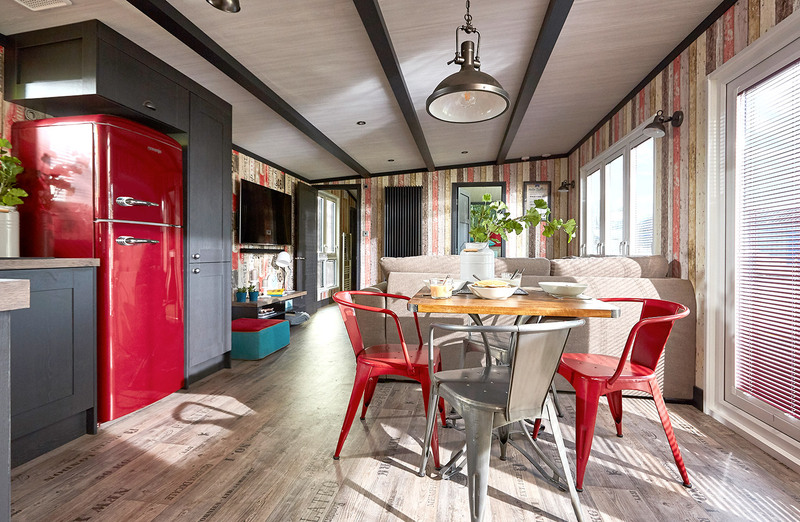 Perhaps the most noticeable change is the exterior design – while many traditional caravans come in any colour you want, as long as its beige, this new caravan is clad with striking, colourful stripes and also comes complete with it’s very own outdoor seating area and hot tub. The cool caravan has arrived, and it’s fit for all the family. Our awesome new accommodation is available at Tattershall Lakes, Whitecliff Bay, Mill Rythe and Sandy Balls.